Caste oppression has a long and convoluted history in Jaffna. There is also, nearly a century’s worth of recorded history of progressive elements within the community agitating against the caste system. Serious ground was beginning to be gained by the anti-caste movement in the 60s and 70s before ethnic conflict and consequent militancy drove the movement underground for nearly three decades. Now post 2009, issues of caste oppression have risen again like a spectre (the LTTE had banned most of its outward manifestations) – and so too have the pushback against it. October 2016 marks the 50th anniversary of a historic march from Chunnakam to Jaffna by thousands of men and women protesting caste oppression. The historic march which took place on 21 October 1966 was overtaken by police brutality. Many of the leaders were beaten up and jailed. Nevertheless, a consciousness had arisen – both in the minds of the anti-casteists as well as the casteists they were addressing – that caste oppression would no longer be acceptable or unchallenged. 50 years later, on 15 October 2016, a conference was convened in Jaffna by a coalition of leftist groups calling themselves the Mass Movement for Social Justice, to review the past as well as to strategise the way forward. 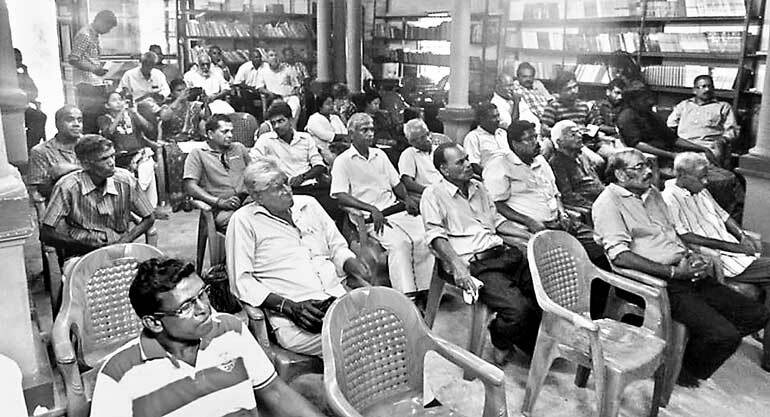 Panels made up of activists, researchers and academics were hosted to review the history and possible future, of the anti-caste movement in Jaffna. Among other things they explored the ways literature and the arts helped combat caste oppression as well as documented its social realties; the current context in terms of land oppression and the economy; education and culture, and so on. S.K. Senthilvel was the guest speaker who explained the history of the anti-caste struggle in Jaffna beginning from 1920s onwards. According to him the Jaffna Youth Congress and other left oriented organisations had begun the struggle in 1924, mostly through peaceful demonstrations. At this time, overt forms of oppression included not allowing the oppressed castes into Hindu temples, and serving them tea in broken bottles or rusted tumblers – not the polished vessels used to serve the oppressing castes. The series of peaceful demonstrations had an effect in that by 1958, three of the major temples of Jaffna – Nallur Murugan, Vanar Panani Sivan and Yal Perumal temples threw their doors open to the oppressed castes. This was a major feat to have achieved without violence – the upper caste management of these temples were progressive for their time – but various other temples had to have their doors broken forcibly over the next decade, before temple entry could take place. Similarly certain tea shops in Jaffna agreed to serve all castes from the same vessels. In the meantime, the V.S.S.K. café became the first restaurant to open its doors wide to everyone as well. All this took place in the late 1950s. Over the next decade, a mostly non-violent movement which has put up with violence from the dominant castes for decades finally decided to retaliate with the slogan, ‘We will no longer offer you our other cheek. If you slap our cheek, we’ll slap yours back’. They took up arms and forced their way into resisting temples and eateries until nearly all these establishments opened their doors. Apart from this historic achievement of opening up temples and tea-shops however, progress in negating other areas of caste oppression continued to be slow; hence the protest march of 1966. In 2016 however, S.K. Senthilvel was not entirely sure whether any tangible progress had been achieved apart from the opening of tea shops and temples. He also noted that Uduvil Girls School in Jaffna, currently under media speculation for controversy of another kind (regarding the retirement of its principal), was the first school to voluntarily offer equal seating in common congregations when serving meals at functions. Before, the oppressed castes whether students or parents, had to sit out of the way, separately. Thereafter, the Government made it a mandatory regulation to serve everyone equally, and took action against principals who flouted the regulation. Ahilan Kadirgamar, a political economist who does research work in Jaffna, presented a paper on Land rights and Economy within Contemporary Caste Society. 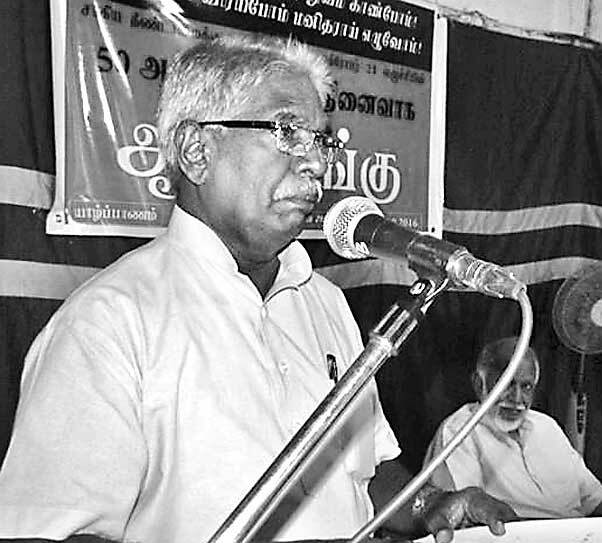 He noted that every time caste oppression is sought to be addressed in Jaffna, many in the mainstream reject the need to do so with the superfluous response of, “Oh but caste oppression is no longer present in Jaffna; we only observe caste when arranging marriages.” However, Ahilan noted, even though the overt forms of tangible oppression had gone underground, oppressive practices were still pervasive – and this could be seen especially when it came to ownership of land, as well as economic structures. The oppressed castes traditionally did not own land. To this day, when educated, socially mobile members of their community attempt to buy land, they are thwarted in multiple, insidious ways; should they succeed even then in buying lands, especially in dominant caste bastians, the community around them tended to harass and marginalise them in various ways. Post-war, when grants were given to rebuild houses to war-affected peoples, the poorest 10% of the war affected in Jaffna lost out on the grant – because a stipulation of the grant is that they should own at least two perches of land to build those houses upon. Needless to say it was mostly the oppressed castes who lost out due to this, through no fault of their own. Akalya Francisglain, a sociology graduate and researcher, presented a paper on education and culture in contemporary caste society. She noted that previous speakers had talked about the value of literature and arts in capturing and documenting the culture and lived realities of the oppressed castes. She however observed that Vellalah culture (the most oppressive caste in Jaffna) being the majority and dominant one, much of literature and the arts tended to pass off Vellalah culture as synonymous with Tamil Jaffna culture. Thus, while some of the other castes did have distinctly different cultures, they were made to feel different or ashamed, with many of the oppressed castes aping Vellalah culture to achieve social mobility in their lives. She said this was a prevalent yet unfortunate phenomenon that had been taking place over time, obliterating non-dominating caste cultures along the way, which as a phenomenon was not enough studied or documented. On that note the academics of Jaffna (few of whom attended the conference) came in for severe criticism from both speakers and the audience, for not researching or critically analysing caste oppressions enough. So also were criticised the local media, who were perceived as not covering the matter in depth. Ajith Balasooriya, a visiting academic from Colombo University, brought up a caste-related phenomenon he had observed in Jaffna that neither the local media nor the Jaffna academics appeared to be covering; the oppression of the palmyrah industry. While outside the peninsula, Jaffna’s cultural identity is deeply entwined with the palmyrah industry – within the peninsula, the industry either doesn’t receive much support or is covertly oppressed – because it is handled by an oppressed caste. “At supermarkets and handicraft shops in Colombo, entire aisles are dedicated to palmyrah products but the shelves are often empty. The sales staff tell us that there is not enough supply to match the demand. Yet over here in Jaffna, I am told that of the four million palmyrah trees standing in the North, only about four percent is being utilised. The rest are going to waste. Mostly because only a certain caste engages in the industry, and even they have been made to feel so ashamed of it that many of them do not practice it if they can avoid it,” said Ajith. Many more aspects of historical and contemporary caste structures as well as the way forward to address them were explored at the conference – by other speakers and during lively participant interaction. These will be explored in a follow-up article.